How to find the Best Water Filter System for your needs? If you’re one of many homeowners who recognise the advantages of switching from bottled water to tap, but your water supply simply isn’t as tasty or as clean as you’d wish, it’s time find a water filter system that can transform your otherwise strange-tasting tap water into a tasty and refreshing source of drinking water. Water filters are the only way to get rid of those elements found in your water that are responsible for altering its taste and odour. The best water filter system will not only improve the palatability of your tap water, but it will also get rid of disease-causing bacteria and contaminants. Multi-stage filtration process: Having any kind of filter in your home is better than not having any at all, however, the best water filter system is that which combines the filtration power of multiple filter media. Targeted filtration: To get the best value for your money, we recommend choosing a filter that can remove the majority of the contaminants present in your tap water. High flow rates: A water filter system that takes forever to filter your water or one that cannot keep up with your demand for filtered water will cause frustration every time you turn on the tap. Now that you know what to look for in a water filter system, let’s see which are the best water filters for your home, office or depending on your water source (e.g. municipal or private well water). The ideal water filter setup is one in which your entire water supply gets filtered. This means that you can get filtered water everywhere in your home – from the water you use for washing dishes to the water you use to flush the toilet. To achieve this, you need to install a whole house water filtration system, also known as a point-of-entry water filter that filters water before it gets distributed throughout your home. Depending on your requirements, you can select from ready-made whole house water filters, or, if you have the technical chops for it, you can custom-build one. Filter replacement is easy and can be done without a plumber. If you need a more targeted whole house filtration, you can create your own filter system by choosing the filter housing and the filter cartridges that are the best at dealing with your water contamination issues. 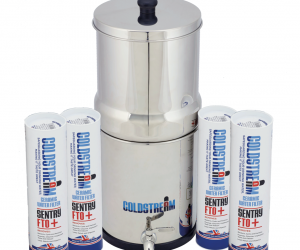 Our range of water filter housings, filter cartridges and accessories can help you build your own filter system that will deliver the kind of filtered water that you want. If you don’t need filtered water in your entire home, just for your kitchen, a point-of-use water filter will do the trick. Under-sink water filters are designed to filter water at the tap they are installed at. Under-sink filters too can be multi-stage, so a high-level of filtration can be achieved with these type of filter systems as well. Space-saving solution, the system fits under your kitchen sink. If you don’t want to invest in a water dispenser for your office, an office water filter system can be a good alternative. When looking for a water filter for your office, you should consider a point-of-use filter, i.e., a countertop or under-sink water filter. The Ecosoft filter recommended above can be suitable for offices as well, especially where there is an increased demand for water. Filter needs to be replaced only every 3 years. The filters recommended above are all for filtering municipal water, which already went through a certain treatment process that usually targets sediments and pathogenic bacteria. But what if you source your household water from elsewhere? Let’s say you draw your water from a private water well, which is the best water filter system for you in this scenario? When your water doesn’t go through the municipal water treatment process, bacterial contamination should be one of your top concerns. Luckily, ultraviolet water filter systems are excellent at destroying any type of microorganisms that may pose a threat to your health. The Pentek 30 LPM UV-120-2 UV Whole House Water Filter System is a top-rated UV water filter system that can produce 30 litres of bacteria-free water per minute. With UV water filter systems, you need a sediment pre-filter as well to remove any sediments that may block UV lights from destroying bacteria. Since your well water is not chlorinated, chlorine and chlorine by-products are not a concern for you, but water hardness, herbicides, pesticides, industrial solvents and other man-made chemicals and pollutants may be. Thus, we recommend testing your water and choosing a filter system that removes problematic ingredients. A great advantage of UV water filters is that they are compatible with any other filter system, so you can easily combine it with any multi-stage or single-stage filter system. The best filter system for you is the one that can efficiently tackle those contaminants present in your water that may pose a threat to your health. Whichever water filter you choose, you need to make sure it contains multiple filter media designed to reduce and remove the contaminants prevalent in your water.